US Postal Service Company is an independently owned/managed agency. They process over 154billion pieces of mail each year and 47% of the worldwide postal business. Every two weeks over 1.8 billion USD is spent on salary to employees which include the 493,000 career employees. Revenue in 2015 was reported as 68.9billionUSD even though that figure represents over 5billionUSD loses. To reach Customer Service, call 1-800-275-8777. If you need to track a delivery, call 1-800-222-1811. You can also find contact information here. To write to Postmaster General, Megan Brennen, address an envelop to Office of Consumer Advocacy, USPS, 475 L’Enfant Plaza, Room 4012, Washington, DC, 20260, USA. Now offering discount postage when purchased online the USPS helps with passports, tax form distribution, Overnight Mail, 2ndDay Delivery, mailing ballots for US elections and also philately (stamp collecting) information. Social presence is found on Facebook, Twitter and LinkedIn. Mail not delivered from April 6 through April 10 when a large amount was delivered before 8 AM. Person delivering mail had no explanation. The entire street had same experience of no mail service. My taxes were mailed from Honolulu Hawaii on March 5 to Gig Harbor, WA. On March 11 there was a message that said it had arrived in Tennessee and would arrive late. What was it doing in Tennessee???? Today it says arrived Seattle Postal Department. It takes 2 to 3 days for mail to get here from Hawaii and this package was sent Priority Mail. Why the delay and why through Tennessee? I have had two packages come in this week and both of them had broken pieces. Antique dishes that have been discontinued. This is from poor handling during shipping. 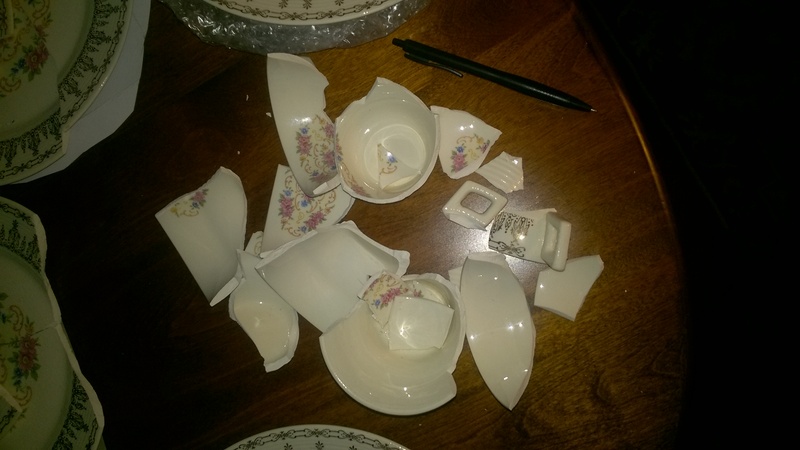 I had 9 plates, 1 creamer, 3 cups, and 5 bowls broken. This isn't the first time this has happened either. It's going to cost me another $200 to replace, if I can find them anywhere. I sent a package from Sunnyvale CA to St Lois Missouri on the 13th of March. When i called the toll free number which is along with the tracking number hundred times. They told me it was delivered. Finally after hundred calls I started calling the post office at St Louis. One lady called Ashley told me two times on different days that it was delivered to the wrong house/apt. Im very very frustrated having spent a lot of my time and energy on this. My package was mailed from Pennsylvania on 03/25/19. It has been tracked to the Allen Park Michigan Network Distribution Center. It arrived there at 0639hrs on 03/26/19. Why has my package been sitting there for six (6) days????? The package is in my area, but has not moved in SIX DAYS!!!!!! I paid for Priority mail delivery. When do I get my package?????? This is unacceptable. Please contact me ASAP. WE HAD P.O. BOX 5455 AT USPS SOUTHFIELD 1925 E. 70TH ST SHREVEPORT SINCE 2005 AND WAS NEVER LATE PAYING OUR DUES. 2019 , WE NEVER RECEIVE ANY NOTICE FOR OUR RENEWAL WHICH WE NORMALLY DO. OUR P.O. BOX WAS BLOCKED AND THE KEYS WERE CHANGED RIGHT AWAY. DENISE ASSIGNED AT THE DESK APRIL 1,2019; 12:17PM WAS SO RUDE. RAYMOND JOHNSON THE SUPERVISOR CAN'T DO ANTYHING ABOUT THE SITUATION. ALL WE'RE ASKING IS TO WAIVE THE EXTRA CHARGES. WE NEVER RECEIVE ANY NOTICE FOR THE RENEWAL. ITS NOT OUR FAULT. DENISE NEEDS TO IMPROVE HER WORK ETHICS. TAX PAYING CUSTOMERS DESERVE BETTER SERVICE. I sent, via Priority Mail, an envelope containing tax forms. As of today, this package has been mishandled, if not lost, and still has not reached the destination in Cincinnati, OH:LC Bookkeeping, 230 Northland Blvd, Suite 104. It has been mishandled outrageously in the Cincinnati Facility. My tracking number is 9510811407939085278300. This is unacceptable. Please deliver asap. I get other people's mail that I have to hand deliver to them. I've lived here for 2 years, with only my name on the mailbox and still consistently get their mail. If I have mail to go out, I'll put it in the mailbox with the flag up. Sometimes he picks it up and sometimes he doesn't. Sometimes he adds new mail without picking up the mail in the box. When I complained to the Cloquet Post Office supervisor, he told me the mail carrier doesn't have to pick up the mail. And he wasn't very nice about it. I do not mind the postal service raining their rates, its just a matter of time before the private sector will take it over. However to lower the cost of the extra ounce stamp by 5 cents is a total rip off. If I could return the stamps with a receipt would be OK but I can not, just another screw up be the government. Can't wait till Fedex takes over your jobs. Do not receive mail.. Letters and bills not delivered and I keep getting neighbors mail so I need to deliver it. Going on for a year but finally decided to complain when I did not receive an important bill in January and have not received mail from a friend which was sent. What can I do about this? Constantly putting mail in the mailbox that doesn't fit causing very large envelopes to split open with contents to spill out into the box. Should't these items be left at the door. We are retired and home most days. We're complained about this carrier before. Carrier refuses to completely fill out notice of attempted delivery slip ! Omitting the senders name ! Has done this consistently !! Also since it is a 20 mile round trip I will not travel for unknown origin piece ! Carrier also about a month ago wedged a oversize parcel into my mail box , BENDING IT so door would NOT CLOSE ! Left lid down . I had to reshape the box opening !!! PO has notation in house authorizing the delivery of OVERSIZED parcels behind driveway gate ! Carrier TOO LAZY to comply !!!!! I have been trying to get ahold of the Brentwood station office 40511 by phone 859-231-0378 for 2 days and it rings and rings only. They say they “delivered” my package to the parcel locker but the key was not put in the mailbox so we could open the locker!!!!!! I need someone to contact me ASAP! The delivery address was 149 Old Towne Walk app 9208 40511 and its not there!!!!! Contact me by phone 270-692-7205. And how can a post office NEVER answer the phone???? The mail carrier keeps skipping my mailbox because apparently they want 15ft on either side of mailbox cleared of snow. These dam mail carriers are so dsm pampered today. When I was younger.. the mail carriers delivered mail rain or shine and walked in the snow!! Today they can't even open their car door and lean over. So friggn pathetic!! They want the mailbox cleared 15ft on either side than they can do it their dam selves!! I do not own the land!! The city does!! I shovel what I can.. if they don't like it too friggn bad!! They get paid good money to just put an Envelope in a mailbox! Do your dam job and stop crying!! Bunch of pampered Turner, Maine government workers!! Don't like how much I shovel, than do it your dam selves!! Go find another job if you can't seem to do the one thing your hired for! I got a change of address lasted April it still is getting yellow sticker on it from my old address and on the left side my new address . Some go to New some go to old. My bills My important stuff is going somewhere it takes sometimes two weeks to get and my income tax return from lasted year keeps going back I go to post office they tell me to fill out paper it never gets fixed I'm going from Pasadena post office to Brooklyn park post office. I'm need help .please I don't know what else to do. I mailed my bill payments from the 27023/ Lewisville,NC post office the 14th of January,2019. They did not reach their destinations untill after the first week February and some arrived even later. for my postal needs? I noticed on a "neighborhood page" online that many others in Lewisville are having similar problems. As you can tell from the photo attached, my mail was delivered to 10471 E. Acacia Avenue, Clovis California 93619 literally destroyed. i knew there was a chance you would open my mail since it was media mail, but I never thought it would be destroyed. It costs too much money to mail things to have them ruined. From: SO MARCO CPU at Sunshine Books. The pkg was 1 lb 8oz. I was charged 11.17$. It took 9 days to arrive. Pkg was returned to my NJ home because street number was incorrect ( my fault). When I returned to NJ to remail pkg it cost 3.27$. If FL Adjunct PO had checked street address, automatically done in NJ, they would have known address was incorrect and not mailed book till I had correct address. As Mayor of Smithton I have and our Village Office Staff has received numerous complaints from residents about inadequate service and disregard of the needs of Postal customers by the Postmaster and postal employees. Postal employees, including the Postmaster, have been inattentive and rude to customers, ignoring them and making them wait while they eat a piece of candy, which I have experienced myself. There has been instances where customers have mailed packages to the same addresses with the same weight and materials and are charged different rates each time or are charged inadequate postage and there is postage due when a package reaches it's destination. We have received multiple complaints of lost mail or mail being delivered to the wrong address and when people complain at the Post Office it falls on deaf ears so they contact the Village for help. The Village has problems with our water and sewer bills not reaching Village residents also. Village of Smithton, Il. 62285. My carrier refuses to get out of her car. I’ve filed complaints at local office. I’ve signed to have things put on my porch. If my box comes when she can’t push it off to a temp carrier ( Thursday’s) she shoves the box in, it takes me struggling and pulling to get it out, while standing right next to a busy road. My video from iPhone will not upload. I’ll be glad to show it to you.? I had a court certified large parcel 12/13/2018 with a return address stamp on card to be returned to the Justice Court #6 p.o. Box 2020 Lakeside AZ. 85929. I did not put my name & mailing address on the parcel. I placed on purpose Cy Peterson & his mailing address on the to and from. Strictly because I wanted the return to go where the green card Stamped return only. This parcel was tampered with scribbling out the from address and person. Then wrote mine name & Lakeside address. I also have a peach sorry we missed you card 1/19/2018 written with Cy Peterson & address scribbled out then my first name only & Lakeside address squeezed on paper. Cy Peterson refused to accept the parcel three times 12/5/2018, 12/22/2018, & 1/3/2018 after the unclaimed certified parcel. Parcel was returned to my Lakeside address three times. This is a vacation address not where my primary home is. As it turn out I happened to be in Lakeside for the sole reason Justice Court #6 needed proof of service. So I drove 4 long hours in winter weather to show purchase. I wasn’t trusting Postal Service for my legal claim case. I almost lost my claim because the Postal service somehow failed to due it’s federal duty as the united court system bases timely matters. I as well as the Untied Court System expect the trusted postal to be handled as federal manner of duty. Mail has been returned to sender for no delivery from carrier also other mail has not been delivered at all. There is a mailbox clearly posted with numbered address on it. Pleaase check tracking # 940010969993814624977 and you will see my complaint !!!!!!!!!!!!! I put in a change of address approximately 3 months ago from PO Box 78362 Baton Rouge, La 70837 to 12742 Rambling Oaks Ave, Baton Rouge, La 70818. I turned this change in at the local 70837 Post Office. My understanding of USPS policy is that you will forward mail from the old address to the new address for 1 year. There has been no forwarding of mail to my new address from the above 70837 Post Office. Result: I accidently discovered a 90-day over due bill that adversely affected my credit rating, which I am working to correct. Also, I did not receive a check that was coming to me. No mail was returned to sender or forwarded to me, There has been NO FORWARDING OF ANY MAIL addressed to the old address to the new address. I've never had this problem in previous moves. I have been trying to find my package since Dec 10-2018. 7 weeks and no contact from Supervisor. I went to the post office and was told to call the number for customer service. I called and left a message - I got a call back from a rep and was told the Supervisor would call me back. and told me she has given it to the Supervisor. No call from customer service or the supervisor for 7 weeks now. records show Was delivered to my mail box??? But it would not fit in my mailbox??? Thursday January 31,2019 carriers of the Boone Post (Boone, Iowa) office were told to clock off by 5pm. Why? The out-going truck does not leave till 6pm. There is still a good half hour of daylight left. I am at the end of the route and did not get delivery. Weather conditions had actually improved during the day. Subs are eligible to work up to 12 hours a day. Why were carriers pulled off the street when there was still an hour of viable time they could have continued on their appointed rounds? Carriers were not maxed out on hours. My mail is being delivered in damaged condition. These are normal 1st class mail usually to pay bills. On 11/19 bill was mailed to Citicorp. they never got it and 25 days later the post office sent it to me in a postal envelope. Envelope and check were mangled.Citi corp charged $60.00 interest that I had to pay. On 12/26 bill was mailed to Century link. As of today they have not received it. On 2 Jan bill was mailed to TECO . Today TECO sent it back to me because the check was so mangled they could not deposit it. I went to the local post office,Oxford,Fl, and they were absolutely NO help and could have cared less as if it were not their problem. Gave me a phone # of 800-275-8777. I called it and estimated wait time for a clerk was more than 1 hour. I then decided to try the computer and it was a hassle to find anything but found this medium and hope it will do some good. This is an ongoing problem with the Calimesa, CA 92320 Post Office. Addressing it with the local Post Office has been fruitless nor has writing an editorial in the local newspaper helped! I’m a Disabled Vietnam Veteran, retired USPS supervisor that is appalled at the lack of respect and flag etiquette displayed by my this local post office! At times the flag is flown overnight without proper illumination or not flown at all! Has been up all week during working hours in the rain! Either take pride and honor our Flag properly or quit flying it! I sincerely hope that this will finally take care of this problem!!! I HAVE MADE SEVERAL CONCERNS TO POST OFFICE LOCATED ON MCCATHERINE BLVD IN CONCORD NORTH CAROLINA RE: MY MAIL ESPECIALLY CARRIERS NOT WANTING TO COME TO MY FRONT DOOR TO LEAVE A PACKAGE . I DO LIVE OFF A DIRT ROAD BUT THIS IS BECOMING A NUSIANCE.AND INCONVIENCE. I LIVE AT 2851 TILLEY ROAD CONCORD NC AND WHEN I RECIEVE A PACKAGE THROUGH MAIL SERVICES THE CARRIER WILL I WILL NOT DELIVER VOICES UNDELIVERABLE. I BELIVE THAT THE CARRIER IS JUST LAZY AND IN A HURRY. I WANT MY MAIL DELIVERED THAT WAS ORDERED FOR DELIVERY. IS THAT NOT A SIMPLE REQUEST. WE HAVE NO OTHER PROBLEMS WITH DELIVERIES AND THEY HAVE HONDAS AND EVEN A HONDA FIT THAT DELIVERS MY MEDICATION. PLEASE REDUCE MY ANGER EITHIER BY REPLACING CARRIER OR JUST DELIVERING MY MAIL LIKE IT IS SUPPOSE TO BE . I had a package delivered to my local Post Office on December 22 end (45600 CA-79, Aguanga,CA 92536) from QVC shipped through UPS and UPS gave me the tracking # 1Z2002040301576021 I went to the post office to get my package and was told they did not have it, I called UPS and was told that a Mr Bush at the post office had signed for it, I called QVC to see if they could help and was told that the post office had sent MY PACKAGE BACK TO QVC..
On the 17th of December we mailed three Christmas cards to each of our Grandchildren with gift cards inside . They were mailed form Melbourne Fl. 32940 to Chambersburg Pa 17201. Two of the three cards arrived on December 22nd and the other was delivered on January the 4th . We in turn received a Christmas card from the PA zip code 17201 of the same address on Jan . 3rd that was mailed on Dec. 21 and received it opened and gift cards stolen from inside the card . That same card had to be hand processed due to the type of card . My concern is did someone open the card at the postal service or was it delivered to the wrong address and the recipient opened it . Either way there was negligence on behalf of the postal service . We sent a Christmas Card to 32 Orchard Meadow Drive , Smithfield , RI 02917 from Melbourne FL 32940 and it was returned to sender with no such number as the reason for return . We have mailed numerous cards to this address in the past with no problem . We called the addressee and they do live at that address. I cannot understand how the postal service can justify raising rates with such poor customer service . and it has not arrived at its destination; tracking number is 70180680000196362980.
next facility. Calling to talk to customer service means a wait of over an hour. Complaining to USPS online is very difficult requiring much personal info. including signing in with a password. Are you kidding me? Its like you make it difficult to make a complaint on purpose. So here it is seven days later and I don't know where my investment check is or whether it has been lost. All USPS tells me is it is in transit to the next facility as of 12 am, Jan.8. So who has it and why is it taking so long despite the fact that it left the Orlando Facility three days ago!!!!!!!!!!! If you lost it just tell me so I can cancel the Teller Bank check. Our public mailbox unit has a broken parcel retrieval box (#4). This has been an issue for some months now. There are two units servicing Brookshire Circle, The one I am referring to is near my address at 4014 Brookshire Circle, Eustis Florida. The lock is broken on Parcel storage/retrieval box #4. Apparently the mail carrier's key/lock works, but ours doesn't. Three of us tried jiggling and turning the key (labeled #4) for about 20 minutes, but could not get it to unlock. Please help. I have a package there that I cannot retrieve. I've left messages for the mail carrier before, but she never follows up. Non-delivery of mail has been an ongoing problem for the last few years. It has gotten particularly unacceptable/careless over the last few months. At one point I was keeping a tally of nonreceipt of mail. I have had blanks checks ordered from the bank delivered to a neighbor and then left on my front porch by him. Utility bills aren't delivered every month. Just last week I had to contact my cable company to pay online so I would not incur late fees since I haven't to date received the bill; I ordered a router for my computer over a week ago which has not arrived; I contacted AT&T today to have another bill sent to me since the bill that normally arrives at the end of the month (December) has not arrived although my neighbors have received their bills. The CPA firm that completes my taxes sends forms for me to complete at the end of November or the first of December and I haven't received these forms, which causes me concern because these forms contain my personal information. This is just a sampling of the careless service I constantly receive. It is negligent and needs to be addressed by someone that can and will resolve the problem. I certainly don't want anyone to lose their job, but I believe my mail carrier needs to work inside the postal facility rather than trying to deliver mail and falling short. I have not have my mail for the past two days. First the mailman was leaving my mail to my next door neighbor and now I just haven"t gotten any. Also why am I getting my mail deliver around 7:00 pm. Is there a shortage in postmans? Please let me know. I"m expecting a check and I haven"t received it. Thank you. My package that was mailed on 12-17-18 in Titusville, FL sat in the post office for five days before sending on to Jacksonville (according to the tracker). My package has yet to make it to Cleveland, Ohio. Sign on the post office door said the cut off for mailing without paying express was Dec 20th. My Christmas card mailed to Maine was sent on the 14th and got there on the 26th. I am getting Christmas cards from friends and family on the 26th who I know mail early every year. My mail carrier replied "Bah HUMBUG!" when I wished him a Merry Christmas last week. This package had been long overdue. It has never been delivered on the address. One of the claimant of the contents of the package has died October 19. Accordingto tracking, it had been with customs for weeks from October 13. The addressee has cancer and was in and out of the hospital but there is always somebody in the house. No package delivered. There was also a mistake in the declaration of the DONATED ITEMS. It was supposed to be $46.00 instead of $460.00. My daughter informed me to expect an express delivery by 12:00 noon. I "STAYED HOME, TURNED RADIO AND T.V. OFF" so I could hear the either the front or back doorbell. Needless to say since it was a large box there was no knock or door bell, just a notice on the front door saying "SORRY WE MISSED YOU". I was waiting for this package. No one ever delivers mail to my front door, my mail box is at my side door. Had they bothered to walk up the driveway, see my car, and observe the back door open and ring the door bell I could have accepted my package that was guaranteed for noon. How are they allowed to get away with this? Again I re-iterate I "WAITED" for this package and no one rang or knocked!!! i am having a problem with the mail carrier not delivering mail.. on 11-24-18 I had a letter placed in my box that had been written on 10-8-18.. It had information in it about my health insurance being cancelled on 10-29-18 if I did not respond. My insurance was cancelled due to not receiving the letter. Where was it at.. Was it in his car? Is he taking bags of mail home when he is running late? 3 weeks ago I had a sorry we missed you for a certified letter.. I was home all day with no attempt to deliver.. 2 weeks ago I had a sorry we missed you.. I was home all day I was in my drive way watching him at the mailbox. He made no attempt to deliver a certified letter.. I called the postmaster at cosby and made a complaint. Today I received another sorry we missed you. I was home all day and no attempt was made at delivery of a certified letter. I placed our mail on hold At the New Tazewell Tn. 37825 in September 2118 for my home and also for our PO box, we returned on November 16,2018. My wife picked up the hold mail so we thought not so today December 13 2018 my wife goes to the New Tazewell PO and is was given a plastic of mail and was told they missed this tub when she picked up our hold mail three weeks ago. in the meantime a parcel with some things my wife had ordered was sent back. today December13 2018 we found a key for a parcel locker you think that parcel is still there. I retired From USPS at the end of 2002 in Jacksonville Florida this kind of service would not have tolerated been there. Delivery service. This problem started in August, 2018 and has been getting worse.I have a weekly newspaper (THE Journal) subscription from Caldwell, Ohio that is apparently not being handled as 2nd class mail. It has been coming in to my address anywhere from 10 days to 2weeks late.This is a periodical, the regulation that covers it is not being followed. As of today December 11, 2018 the November26,2018 has not arrived, December 3,2018 has not arrived and as of today I'm looking for the December10,2018 copy. The Journal is mailed out of the Caldwell office every Monday evening in #1 sacks. When I have Journal dispatcher hand carry my paper to the Post Office and have it (round dated) it usually arrives at my address on the following Thursday or Friday. Where is my paper??? The mail carrier that delivers to 4330 30th St. San Diego, CA 92104 Was rude and verbally abusive to me. He was delivering the mail. I thought he was finished I used my key to open my box and retrieve my mail from yesterday. He yelled and said I would have to pick up my mail from the post office if I ever did that again. He was very angry and hostile. I called him on his tone to me and he became even more hostile. I should have gotten is name. He is a Mexican guy that is all I know. He said he was respectful, but yelling and threatening an elderly woman is not respectful. He never learned that disrespect begets disrespect. The post office in my neighborhood is constantly unmanned. A line of paying customers, but one postal employee. This is not acceptable. There should always be at least three employees on duty to accommodate the flow, especially during holidays. For the last 2 weeks we have been getting mail that belongs to other people, including a package from amazon prime that we are sending back to the mailman. I have delivered some of the mail that belonged to our neighbors to their house. I just don't get it, do they get in such a hurry that they don't pay attention? What about my mail, how many pieces have gone to the wrong addresses and I never got them? I am expecting a very important check in the mail, do I have to worry? Also why are we getting the mail past 6pm on many days again? Mail delivery to another home on Darthmouth Street with the with the same numerical address as ours 10160 Burton ave . Oak Park Mich. The homeowner was kind enough to bring the package to us; this has been a recurring event; it needs to stop. Please instruct you delivery person that these are different streets though the addresses are the same!! We continue to not receive our mail and we receive others. This past Saturday, the system said I had mail but there was NOTHING in my box. When I called the postmaster (Keith) he said he had a substitute 'Can't find good help' was his comment. At this point no idea where all my mail is from Saturday. We are sure to increase the price of stamps though. Sorry, just very frustrating. Supposely, delivered Tuesday, October, 23 2018 and it stated in Amazon under delivery :"Package was left inside the residence mailbox'" . I would very much appreciate you investigating this issue. Ordered couple of items thru Amazon -- they were supposed to be delivered TODAY! Just checked tracking & it states that one package was left on front porch by mailbox & 2nd package was left inside mailbox! First tracking #IS 9361289676090739577017 and second tracking ID#9374889676090791984101.THERE IS NOTHING THERE.!!! I have been here all day & no one even knocked on door!!! FIND MY PACKAGES ASAP!!! VERY DISAPPOINTED WITH Postal Service lately!!! Late delivery, none some days!! Never same carrier two days in a row!!! COME ON, THEY MAKE GOOD MONEY, WHY CAN'T THEY DO THE JOB RIGHT?!?!?! I have not received mail on a regular bases. Contacted the utility departments and from July 9, 2018 when they were mailed out but I have not received any of them as of today, at least 3 different companies. This is unacceptable, I have not even received fliers or sales papers. I went to the post office and gave my info and told the supervisor would look into it. From June 26, 2018 through July 27, 2018, we put our mail on hold. During that time, according to my tracking information, six (6) packages were delivered to me. However, when we picked up our mail on Monday, July 30, 2018, none of the 6 packages were there. I have tracking numbers for all the packages saying they were either delivered or held by customer request. So, where are my packages? Furthermore, when I asked the postal worker what I should do about this problem she said to me, "I don't know". Well, if she does not know, how am I supposed to know what to do? I also want you to understand that this is over $500.00 of merchandise that is missing. Was contacted by postmaster on 23 July in reference to complaint. About my original call not being returned, he said he knocked on my door and no one answered, so why call. Typical Alpha male, his way or no way. Won't listen. No politeness. No care about the customer. Exaggerates a lot. He says my mail delivery is impossible because of uncut lawn and fear of bugs and has stopped my mail delivery, again, the second time, despite the fact he delivered my mail himself after a couple of days of non-delivery the first time on the 19th. Mail delivery continued until he canceled again on 23 July in retaliation to my complaint. He also said my driveway was blocked with my cars. I thought cars were supposed to be placed in a driveway. I am 69 and 80% disabled with broken back, PTSD, anxiety, and high blood pressure. It is hard for me to get out and around. I will have to pick it up at his post office or it will be returned in 10 days. I get out of the house about once a month. My bills will be late being received and sent out. Most of my food and medications are delivered. I am also suffering from very high stress levels in this situation. I feel very pressured and victimized by a bully. I thought there was a program that if delivered mail was untouched for a few days, someone would be notified in case aid was needed. How will this work now? I rec'd a package that I ordered from QVC on Tuesday (7/17), it came a day early. The postal person threw my package on my front door porch. I heard the box when it hit the porch. By the time I got to the door she had pulled off. Just glad it was not glass or labeled fragile. This package was delivered to 823-33rd Ave., Tuscaloosa, Ala. 35401. I talked to my mail carrier today and she told me what to do. This is the USPS TRACKING # eVs 9261 2909 8132 7457 1010 2630 08. Also my neighbor witnessed this action & told me what they saw. I don't expect to order stuff and have the mail services throw it on the porch, there are 2 chairs on the porch, set it in one of those. I am not pleased at this time. Thank you. Lost my perishable package for over a week after I was told it would be delivered in 3 days. No one could find it. Then 1 1/12 weeks later it shows up in Florida from Alaska going to Minnesota. The post office tells me priority package does not mean it will get delivered!!!! then the package is repackaged and shipped to the declinational post office ruined and they had to thru it away . I Called and filled a complaint and was told I will get a call from a supervisor by the end of the week. NO CALL BACK AFTER 2 WEEKS WAITING !!!!! USPS IS THE WORST COSTOMER SERVICE . I WILL BE CALLING AGAIN!!!!! A delivery attempt was made on Wed 7/18/18, which a slip was left . I called Lincolnton P.O. in Harlem for package redelivery. My package was not delivery on Thurs, so I called Lincolnton P.O. on Friday, but was placed on hold for over 30 mins, because the clerk who answered my call was clearly having a bad day and would not give me her name. I only wanted to know where my package was for pick up. No one picked up my call. 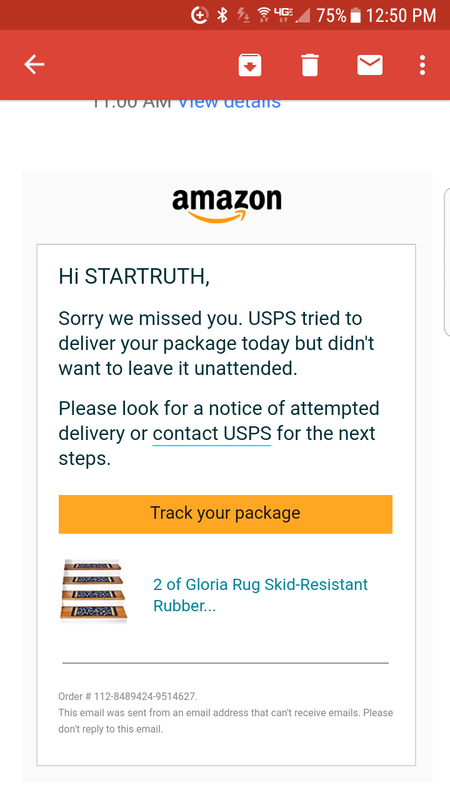 I wanted to know why if I have a package why they can't deliver to my door. I have not had a problem in the past. I have a long driveway so no problem anyone stealing my package. I was Tracking my package today it was to be delivered but got a email was told my mailbox was full it's 12:30 now my mail never delivered till after 2pm. I have this problem all the time I have a package. Now when I can I use another service. Plantsville Ct. Post office. Postmaster refused to fly POW/MIA flag on flag day as directed. In reference to tracking code: 94055159010517453224152. I had 15 baby keets (guineas) shipped from Pennsylvania to Marion NC, 2 day guarantee delivery. The birds arrived here on time and I was called this afternoon for a pick up at the Marion, NC post office. When I arrived I was told all the birds were dead and had been since before being transported from Asheville, NC to Marion. At least that's what the driver told the receiving clerk. He said he heard no peeps or movement from the box when he picked it up in Asheville. So something must have happened to them between Philadelphia and Asheville. 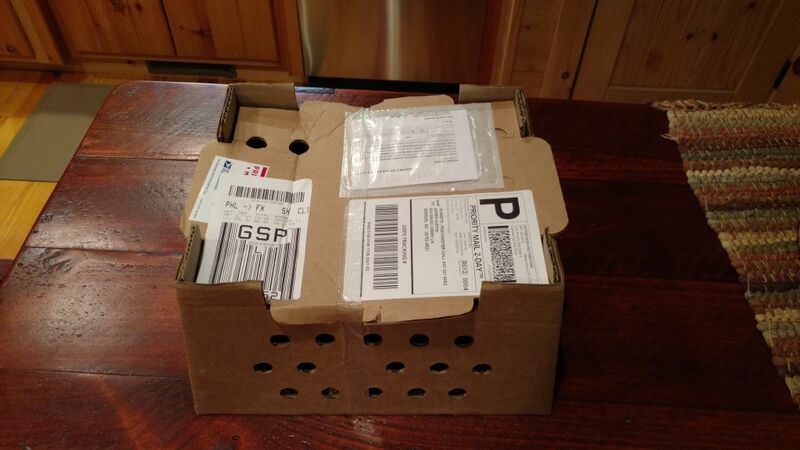 The box arrived in pristine condition with no dents or any visible damage, However once you cut the tape and opened it up...all 15 birds were dead. It is obvious to me, as well as I am it is to you, that these birds probably died from heat exposure. They were left in the van/truck, perhaps in direct sunlight. The temperature got to them. Is this how you train your drivers? I know they have a lot to move in a short period of time and speed is of the essence. But to ignore live animals and not seem to care if they live or die, as long as you get to your destination on time (that's all that matters)? Come on folks! I know I probably won't get a reply from you. That's the way government works. I should know. I was in the AF for 25 years. At least I hope someone reads this and does some research as to who, what, how, and why. I use USPS almost daily and pay the price to have two day shipping. I just received this from one of my customers and I can drive there in a few hours from where it was shipped. Sarasota to Orlando. See below, just wanted you to know that my order for Atomic Grow which you sent on 7/26 just arrived TODAY....8/5.....you sent it by USPS 2 day priority mail at a cost of $6.80 and it took 8 days to go to Orlando, ridiculous. I think you should demand USPS refund your postage costs. You can credit my Visa card for that amount since service was so horrible. I would consider not using them in the future. On the evening of May 20, 2016, I purchased 3 money orders from the Post Office. Brought these money orders at 170 Martine Ave in White Plains,N.Y. Total cost of the money orders was $1062.42. Before I got out of the post office, I took time to place the money orders with receipt inside a Walmart shopping bag. Then I went to do some shopping at Walmart. By the way, I happen to be the last customer in the post office. Also I just was able to make the post office before closing. So once I completed all my shopping, I go to check out. Paid for all my items. The next thing I notice that I took the bag with the money orders and receipt inside and placed it on the counter. I used a shopping cart to place items in while I'am shopping. Rushing to put all those bags inside the cart, not noticing that I left that one shopping bag at Walmart. Before I got home, I did some extra shopping at a few other retail stores. May I add while all this was going, It was 6:30pm. I got home, I was tired, I noticed my bag with the money orders & receipt is not on me. I was freaking out. Ran out my apartment and told a friend next door, I left my bag at Walmart or maybe at one of the few other stores I shopped at. Now at this time It was just after 9:15pm. So me and a friend of mine, drove back to two of the three stores I shopped at. Both places no Walmart bag. So getting to the point I just was to tired & confused to carry on. So both of us decided to call It a Friday night. The next morning I went back to Walmart, the place I should went back the evening before. Got to the store and ask an employee has any body seen a missing Walmart bag. Went to Customer Service "Lost & Found" Check there, guess what? no bag. So this time I went back to Walmart.. Ask, I want to speak to a manager. Told the manager I'd like for you guys to review video. I What was taking place at the time of check out. About an hour later they reviewed the video. It took several 20minute intervals to see what was happening. So at first, the security person said he saw the woman that checked me out, placed my bag under the counter. Than 10, maybe 15mins later, security guy, saw the woman just continuing to check shoppers out, while my bag is left unattended. Meanwhile, precious time is passing and It is closing time. After awhile, the guy came back a third time, also with another manager and both decided that probably one the employees from the maintenance department, tossed my bag with all my belongings in the garbage bind. So I tell myself If only that woman took the time to briefly step away for only a few minutes and returning my bag, It could of made a world of difference of retrieving It, Then taking along time in filing this complaint. So in closing, I need to be careful when buying money orders. Keeping it in a safe place. The wallet for example. I hope something good will come of this. To whom it may concern, I hope my compliant was clear and understanding. My package tracking #9400110200830180004849, which I was tracking went to the Myrtle Beach Post Office at 505 North Kings Highway. The Postal Service employee posted on the tracking site that it was un deliverable on Friday June 3, 2016. I went to the Post Office on June 3, 2016 and asked that they give me the package. 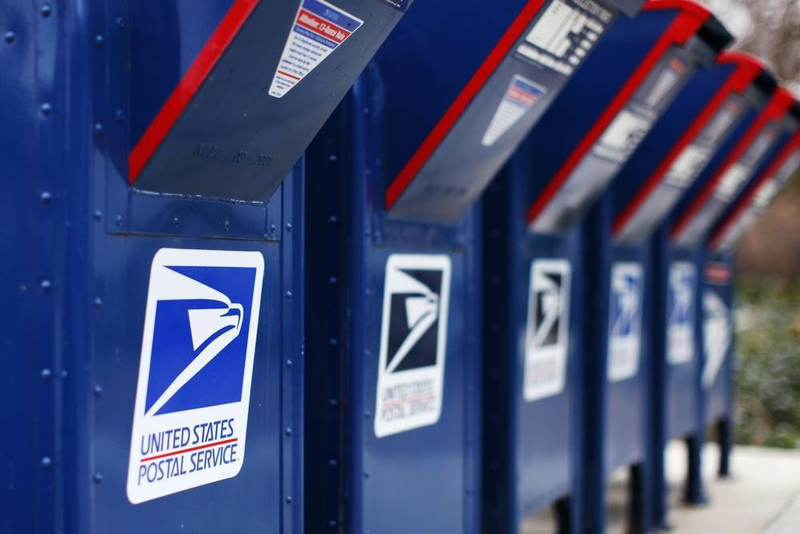 The PO employees stated that the mail carrier had not returned. They took my number and said that they would call me. The did not call me. I went to the PO on Saturday June 4, 2016 and asked that they give my package, the checked and said that it was out for redelivery. My mail carrier came today and no package. Please help me retrieve this package so that it is not sent back. This is the fourth time that I have had this problem over the last two years. My husband and I are retired and spend approximately six months out of state and Whatcom County. We have had a post office box at the Mount Baker station on Orleans Street for fourteen plus years. We have had a few issues from time to time about having our mail forwarded. My box rental expires in April so I call the Mount Baker station to verify the current box rental rate for the coming year as we usually return to Bellingham late April or mid-May. On April 11, 2016 I made a call to USPS at 10:30 a.m. and spoke to a clerk for 8 minutes and 15 seconds. I was told that my new rate would be $86.00. On April 22, 2016 I forwarded my check in that amount to the Orleans address. On May 29, 2016 I went to the post office to collect my mail. Unfortunately, the box was locked denying me access. To make matters worse, it was a holiday weekend so I had to wait until May 31st to speak with a USPS representative. Before contacting the USPS, I checked my bank account -- the check I had written on April 22nd had not been cashed. At 8:37 a.m. on May 31, 2016, I spoke with Jacob at the Mount Baker station. After 23 minutes and 54 seconds, I was informed that my box was empty and the mail had been disposed of because of non-payment. I am still in the state of shock as several pieces of mail were important documents and/or checks. Since I am out of town again, I asked Jacob if he would accept a debit or credit card to reinstate my box fee to eliminate further delay in receiving my mail. I was informed that my request was not possible. Under the circumstances, I am at a loss why he could not make an exception. If you put in a change of address on line, USPS accepts credit/debit cards for payment of this service. You can purchase stamps or pay for shipment of packages (and even get cash back) when paying in person with a credit or debit card. I would think that after some fourteen years of being a faithful and good customer, someone would or could have made some effort to contact me before destroying my mail. Hopefully, USPS will revisit their policy about receiving box rental payment online in order to avoid having to go through what I have experienced. This is the 4th time that I get email(s) that my package(s) are "out for delivery", but the packages aren't delivered even though the regular mail is. You would think the carrier would deliver them the following day after returning to the Post Office with them , but it takes 2 or 3 day after that before the packages are finally delivered. When we travel, it is nearly impossible to be sure that Premium Forwarding is going to work although the charge is just under $100 for three forwards. This time we were going to be gone three weeks and asked that our mail simply be held. When we returned, there was mail in our box including a check that had been there for two weeks! I went to the local post office to complain to the post master and she was "Much too busy" to come to the counter and I was unable to talk to her. What does a person do? Our mail carrier is for lack of a better word at this moment "terrible" and lazy. He many times does NOT get out of the truck if a package won't fit in the mailbox. When he does deliver to the porch, he places it at the very edge (in direct sight and sunlight) when it would be just as easy to place it up near the door out of direct sight and sunlight. In particular, I had a package of medication delivered today which should be stored at temperatures below 70 degrees (refrigeration is recommended) but when I came home it was sitting at the edge of my porch in direct sunlight! That is nearly a $60 bottle of medication. This is somewhat of a final straw for me! He continually pushes our outgoing mail to the back of the mailbox as he shoves our incoming mail into the box ? It is not at all uncommon on a weekly basis to end up with someone else's mail. If there happens to be ANYONE in our neighborhood having work done and a work truck is even partially blocking his way, he will avoid mail delivery AT ALL. Now having said all this, I understand we are considered "rural" in Jenks, America but our previous mail carrier who retired 1.5 years ago was great and never pulled any of these tactics. She even went out of her way to get to know her clients. I'm sorry, but this gentleman (being kind) is far from meeting even a basic level of satisfaction with his customers and I am NOT the only one complaining. Others have complained and nothing has been done! I love our USPS site in Jenks and they are very kind, helpful and efficient. However, our mail delivery system has declined terribly in the past 1.5 years (we have been here 15 years)! I live in a condo development in San Diego. We have a central mailroom where letters are delivered to boxes and smaller packages can be placed in parcel lockers. If the package is placed in a parcel locker, a key to the locker is put in our mailbox so this can be retrieved. I have had a record of a package being delivered to a parcel locker twice in the last month (latest tracking information for the second delivery is 9400111899563774259664) but have not received the package after the merchant has sent this to the correct address twice. This not only affects me, but I cannot continue to have the shipper re-send packages that are mis-delivered and the recipient has not been honest enough to bring the package to me or leave it out for the post office worker to redeliver. I have noticed a large amount of mis-delivered mail at this address. I, myself, have re-delivered packages directly to a condo when the key is mistakenly put in my box. Whoever received my package (twice, whether the same person or not) was apparently not honest enough to re-deliver. Additionally, I see a lot of letters marked mis-delivered that are left out on the table in the mail room. I think you need to look into the performance of the postal worker who is assigned to our condo development. My package, tracking #9505 5121 3043 6123 3035 05 was put in your system on 5/2/16. As of 5/7/16 it has been returned to the chicago metro hub 3 times. If this is how you handle 2 day flat rate service it is no wonder the general population has no use for those in charge of our government. I wouldn't give this service one star. I mailed a letter that was priority and certified with return receipt and paid 12.45 for it on April 14 2016 going to an APO address. My complaint is that it still has not arrived at its destination as of today. This should be made clear to customers that no matter what you pay it will take 3 times as long to get there and the price should reflect the poor service through the USPS. When I made contact with customer service they gave me 2 forms of contact to the military PO and neither was working. I lived at the Grand Canyon for 5 years. The Post Office is open from 9-4:30, when you work 8-5 it makes it difficult to get your packages, so I would go at lunch time, there was only 1 person manning the windows as a rule, so much of my lunch time would be taken by waiting. They use to be open 11-1 on Saturday, this gave you an option, but now they are closed on Saturdays. So I closed my box out on April 1 before I left the canyon and Tom told me that my mail would be held for 90 days, I have been on vacation so getting another address has taken me a couple of weeks. I called to check on a package that was do to arrive, and was told that as of April 11th my mail was returned to sender. This PO is just a joke. On Wednesday, April 6, 2016 at 12:10 pm, I was waiting to turn left from westbound 51st St. onto southbound Geneva Ave (Hwy 120) in Oakdale, Minn. Apparently the driver of USPS vehicle 0230505, who was behind me, was in too much of a hurry to wait to turn right from 51st and he jumped a curb and sprayed rocks, dirt and mud on the passenger side of my vehicle while pulling onto northbound Geneva. Attached are pictures. I do not know if there is damage yet besides the cleaning costs, since it just happened and I'm at work, but you can be assured I will be inspecting each and every mud/rock splash for chips. Please advise on how to proceed with this complaint. I had my held for 30 days (3/1-3/30 2016). Confirmation number CAH236308762. Today it was delivered to my neighbors home and she is holding it for us. She also rec'd. her held mali and two other addresses. These she returned to the post office. Perhaps we need an "undercover" boss to inspect what you and I expect? Last year my held mail for 30 days + was never delivered as requested. A package was dropped of with the postal clerk at 12:01pm on Monday Feb 22,2016. The mail was to be sent priority mail 3-Day. I understand this is just an estimate, however today Friday Feb 26, 2016 the package is still in the Kearny NJ facility. This I find extremely disheartening. I send packages all the time and the tracking is always updated. To make matters worse I called the NJ Palisades office and spoke with a female supervisor at 4:34 who asked for the tracking number but did not bother to input the information in the system and passed me off to a clerk. The clerk tried to help but I feel the supervisor should have provided some type of action plan, Not nothing can be done. I'm I suppose to wait indefinitely for this package before someone attempts to look into this. I just need to know when the package will start. I'm not looking for a refund I just want the package delivered. I track send packages all over the world and when things sit it's usually a problem. Your Rural Office located in Coal Creek, Co. has antiquated equipment and is run inadequately! I don't blame the staff as much as the lack of resources they have to work with! I live right near this office and mail out many items due to my online business. 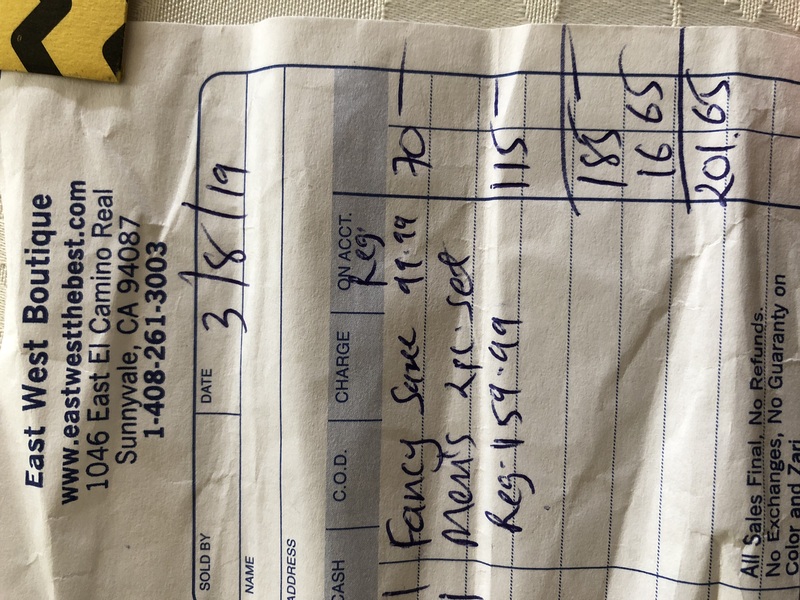 The desk clerk is not able to print out a receipt with the tracking info on it, so they crudely hand me a sticker with a (tracking) number on it. This has been going on for years! I can get by as long as nothing goes wrong but occasionally these small stickers with tracking on them get lost, and then the fun begins! They say they have no way to retrieve it? Any other location could handle this as long as I have proof of payment but at this location I am usually SOL. I know it's a small hub but c'mon! It's one step away from pony express! Not happy. For the past MANY months, perhaps even more than a year, I have had terribly first class mail delivery service for my business. I am located right next door to the post office in Lombard, Illinois, yet at least once a week I get nooutgoing mail. My complaints to the post office fall on deaf ears. In attempts to talk directly to the post master, I am always told she's not available. Then issue my complaint to the person on the phone.....yet the problem continues. I cannot understand why as a business, I should not be getting service EVERY DAY, considering I am right next door to the post office. I moved from Imperial Tx to Colorado on Dec. 6, 2015. I call in January to complain about the PO in Imperial, Tx 79743.The man that took the information only got my new address. I asked him if he wanted my old address and he assured me that someone would call within 72 hrs and they would get it then. Needless to say, they called the PO where I live now and told them I was not getting my mail. Imperial, Tx, 79743 clerks fault. I handed the clerk in Imperial a change of address on the 5th of Dec. 2015. She sent my mail back to the senders. I had to call everyone and give them my address so I would not have late fees. She finally started sending me mail in priority envelopes. Two weeks ago, I got 4 other Imperial Tx residents mail along with mine. This was a common thing of getting someone else's mail in my box before I moved. Everyone in Imperial has had the same problem. I would like something done about her. She does not need to be in a PO anywhere. I have moved more than once and this is the worst it has ever been. I did not even get the notices for my PU's registration. I had not received mail for 3 weeks, so on Thursday I called US Postal customer service. On this day, Monday, February 8, 2016, I returned J. Ellison's phone call. I told her exactly why I called. She explained that the mail carrier had put a notice in my box that my box was full and that further mail was being held, I believe she said at the Glenwood Post Office. I told her that I didn't receive a notice and that the carrier can say they put a notice in the box. I then asked her if the notices could be sent electronically that way there would be proof a carrier did or did not do something, her response was "No" with an explanation that was very lengthy. At the end of her statement she said and I quote, I tend to take the mail carriers word on putting notices in the boxes". I then got very defensive because she was calling me a liar, and I said just that. She then said I was putting words in her mouth, which I was not. I was just doing the math. The carrier told his side, I told my side, and she believed the carrier which = I am the liar. Even if this is the post offices' way of thinking, it should not be vocalized to the customer. At the beginning of the conversation I told Ms. Ellison or Allison, I had not had any problems with mail delivery in the 19 months I lived at this address. She told me that this was a new carrier. I pick my mail up about twice a week as I am out of town often. I pick it up on Friday and/or Saturday, and another day of the week. It has not been a concern until the past 3 weeks. I hope these are not the responses people in authority are trained to say to customers, as it was in NO way a person in a supervisory position should speak to a customer. I paid $12.44 to buy a music book from Ebay. On the front of the package is a label "BOOK: PLEASE DO NOT BEND". The package was doubled up in my mailbox. The package size was 11x13 (picture below) The packer of the music did good with cardboard and all but the book was still bent from the delivery. I am not happy! Delivered on 2/6/16. I have lived at my current residence since August 2013. To date in total my wife and I have gone to the post office at least 10 times to pick up items that were supposed to be delivered to my residence. On all these occasions I have had to use the internet to track our mail/packages. Today, 6 February 2016, as I was walking out of my house to go to work I saw the delivery man driving his mail truck across the street and he had already past my residence. When he saw me he came back around and gave me a package I was expecting. On the package, he had written down that he attempted to deliver the package. My wife is always at home 100% of the time, especially when we are expecting a package. The mailman did not leave a note in the mailbox or at the door that he attempted to deliver anything. 3. No vehicles were blocking the mailbox. 810 Deblea Court, Jacksonville, NC 28546 is our address. I am really disappointed to think that all time since we move here this is the reason why we have had to go the post office to pick our mail. I anxiously await your response/action on this issue. February 2nd 2016 at 4.40pm I went to a post office located at 101 Hyde Street, San Francisco, CA, 94102 to receive my package. This post office has no security guards and to get any sort of service you have to go to a window, ring a bell and wait for some time for someone to come out and assist you. When I came in there were 2 people in line who said that they rang a bell a while ago but no one came out. I went to the opposite side of the hall to see if I can find anyone but the window was closed.As I was going back an African-American man came in and went directly to me trying to hug me. I stepped back and rushed to the people in line.He followed me.I started ringing the bell again trying just to get some help and all that time this man continued sexually harassing me and when an old gentleman in line stood up for me the man became enraged and started screaming until I told him I will call 911 if he will not let me alone.He went to another side of the hall continuing to threaten me. I was so afraid that I rang the bell again.Finally a woman came out and started helping the people who were in line ahead of me. She got really annoyed with one gentleman so she just turned around and left. I came up to the window,rang the bell once and said "Can you please come back". People behind me reached for the bell and started ringing frantically. She ran to the window and started screaming at me saying that I am being rude that she knows that it is me ringing the bell all the time and that she is going to call police on me. I tried to explain to her that I am being harassed by a man who is still in the building that I am not feeling safe and that I just want to take my package and leave but she continued screaming at me about the bell. Finally she got my package,passed it to me and didn't even ask if I was ok or if I felt safe. This was the most frightening experience I've ever had. The woman was extremely rude and insensitive and if she would have been there to do her job I wouldn't have been subjected to sexual harassment in a government establishment. I was very shook by the whole experience and I would never want to deal with this post office ever again. I have a package that was supposed to be delivered yesterday, 2/1/16. Never received it. I tracked it again today, it still shows 2/1/16. I have been trying to contact someone for at least 2 hours and can't get through to anyone. I ask for a Representative and the voice mail message keeps repeating "No one is available at this time". They open at 9:30, it is almost 11 AM. The Franklin Park phone number is not working and I just get a get a fast busy signal. 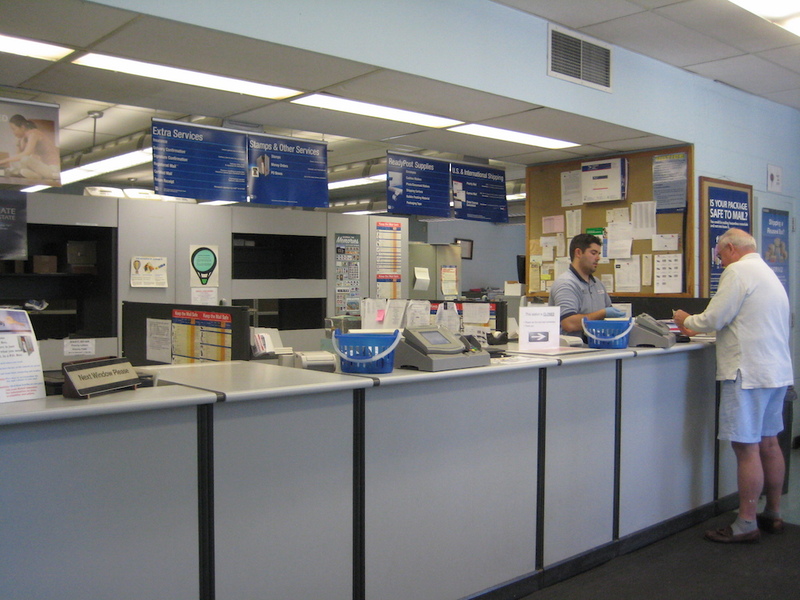 How do you get to talk to a real live human at the US Postal Department? I ordered an item online on Tuesday January 19th that was being delivered via USPS. I tracked my package online, which stated that my package was 'out for delivery' on Monday January 25th. The package never arrived and after tracking every day after the 25th, it now says, 'no update on tracking information'. It also never displayed that the package was 'delivered'. I phoned the 1-800 number for USPS on friday January 29th and they told me that they don't know what happened to the package and that the local post office will call me within 24 to 72 hours. The local post office phoned me the next day and they also stated that they don't know what became of my package, and that they could see that it was never delivered. They then told me that they would check with the postal carrier and phone me back. They never did and I have yet to receive my package. I either want my package or compensation from the USPS. Our mail carrier has delivered at least 8 packages to me late (including 2 that were supposed to be delivered 2 days ago), claiming "Undeliverable" and also "Address Issue" in the past couple months. Surprisingly the address on every package when I do get is correct. No mail was delivered yesterday or today...granted mailboxes were snowed in yesterday but not today. I believe we have a new Mail Carrier because we never had this issue with last female Mail Carrier. I pay for my packages to be here and I expect to find in mailbox when i get messages saying "Out For Delivery":. I hope something gets done about our Mail Carrier so I don't have to pursue this any further. The US Postal Service mail delivery to our house before and after Jonas has been unsatisfactory. We have not had mail delivered since Thursday 21 January and it is now 4 pm on Tuesday the 26th still no mail. I can see no mail on 23rd during the storm but the roads have been cleared since yesterday and the snow has been cleared away from the mail box since yesterday morning so the carrier could access the box without getting out of the vehicle. When we called the Ashland Post Office this morning Lisa (PM?) said they were doing the best they can and would get to the customers missed Friday and Monday first as we are near the end of the route for our carrier. That did not happen. It is also strange that friends in neighboring Mechanicsville got their mail on Friday and the snow accumulation was the same. No mail delivery, late mail delivery, wrong mail delivery, mail returned (including utility bills) with note no such person at the address, mail returned due to house being abandoned, mail not delivered due to blocked mailbox (Not true!) This has been going on for eight months. I have complained repeatedly (formally three times). The situation improves for a couple of weeks, then back to the same problems. This type of complaint is all too common for 77082 Whittington location. In person complaints are pointless. The people are rude to customers and don't seem to care. Someone somewhere needs to address this matter. I am sick the United Postal Service, wasting so much money, way too many Priority boxes. They came out with 16-17 boxes 8 years ago, to now be discontinuing most all of them. They are in debt, I wonder why? Now, you cannot buy postage for boxes A & B on line, you have to go to the Post office, which has let go of most employee's, you stand in line for 20 min. to be helped. Seems the online is a heck is a no brainer, a lot cheaper, then hiring employee's. Yesterday, I called USPS, three times, was on wait for over a hr. each time, had to hang up, finally got a hold of them, after 1½ hr. hold. On several occasions I have gone to the Post Office and found them to be closed for Lunch between the hours of 12 pm and 2 pm depending on the day. While I understand that people need to take a Hour break and are entitled to it but I don't understand why 1 person cant keep the window open for business while others take their break. This has happened a lot in the Saint Johnsville, NY office. We are constantly being asked to pay higher prices for your services but we never get anything back in return. 1/12/19 (now 19th), nor an updated delivery date. In following-up with the Main Post Office, they could not assure me that my two letters were delivered, this was after finding your Tracking on-line provided no help. Both were time sensitive documents. I sent a Christmas package 5.5" W x 7.5" L x 3.5" H with a cell phone charging bank Mpdel #MJ06 to my daughter Rebeca, with her full name written on it in Permanent Marker. My daughter and I both tracked the package by it's tracking number 9500-1111-8564-60075836-37. The tracking information states the was delivered too. Not having insurance on a package is no excuse for USPS to not properly deliver or loose their USPS Customer Packages. We suspect the Postman or Postmen delivering to the apartment complex where my daughter lives are stealing or calibrating with a group of thieves who are stealing my daughter's and other tenants packages by delivering those packages to the wrong apartment number on purpose! Because my daughter has lost many packages! I have had a lot of packages delivered by USPS that have came up missing. I have tried filing complaints in the past and never have heard back. However, my dad recently sent me a gift through USPS that had been delivered Monday January 11, 2016. The problem is I never received the package and we have already confirmed that the address and apartment number were written correctly on the package. Unfortunately the package did not have insurance, but since I continually have this problem with USPS I wanted to file a complaint here to see what can be done about figuring out what happened to my package and holding the person her delivered it accountable. I also would like to see that the postal delivery man or woman gets my packages to the right door the next time I have something shipped through USPS. The tracking number for the package that was supposedly delivered Monday January 11, 2016 is 9500111185646007583637. It is very upsetting that I feel I cannot have packages sent to me here because they almost always never make it to my door. As I mentioned before, this is not the first time USPS delivered my package yet I never received it. I sent an international package on 1/11/16. It was returned to me on 1/13/16. My po on Viking dr. where I mailed it didn't know why it was sent back as everything was correct. They stamped it and said they were going to try again and gave me a receipt with the same tracking number that does not work. #LZ 529858213US. I've been trying to call for hours to no avail. The first time I didn't even get a person, just dead air, and then the survey. Needless to say, I was not pleased. My customer is up in arms because there is no tracking number. I had a package coming from Italy. After 30 days past I contacted the person in Italy and was told that the package was in my post office for a while. He gave me the tracking # (ra592627733it) and I went to pick it up. The post office told me they had no record of it and they could not help me. I called the international office and they said that the rider street station in Brooklyn n.y. had tried to deliver the package one time and fail do so -- no one home so they say. I pick up the mail all the time! the mailman did not leave any kind of notice to let me know of the attempt to deliver so I could not know that the package was even in the USA let alone at my house. Mailed an overnight letter by USPS on Sunday to be delivered on Monday on a Business, 4 hours round trip from my home. USPS tried to deliver on Monday at 5 AM, didn’t find anybody, kidnapped my letter at theirs post office giving me 5 days to make 4 hours round trip to get back the letter or send back to me after 5 days. The letter was time sensitive and destination was a business. What kind of dead brain sheep morons are USPS employee, going out of business hours, to make deliveries at Business at 1AM, 2AM, 3AM, 4AM 5AM and tell you that there was nobody. I do not care for $13.25 I paid. The damage they inflicted to me is much bigger. Government is doing nothing, they are looking other way. Next time I will drive 4 hours and deliver my letter by myself. The postman is very arrogant, does not answer any question, delivers mail to wrong address, delivers mail in 800 block of n Marengo. Short latino man, wears big straw hat should not be on this route was so much better with other postman. He needs to get an attitude adjustment. Neighbors are complaining. Please see if you can get this solved asap. If you give your post man an item, and a wad of cash, he, or any other Postal Service employee that touches it, is not responsible for anything in any way. I learned my lesson the very expensive and hard way to always insure my packages. I sent an HD Television set to a customer through USPS, and a week later, got a nasty email about the condition of the product. I asked for pictures, and what they sent me was horrifying. It must have been crushed by something 10x it’s own weight. 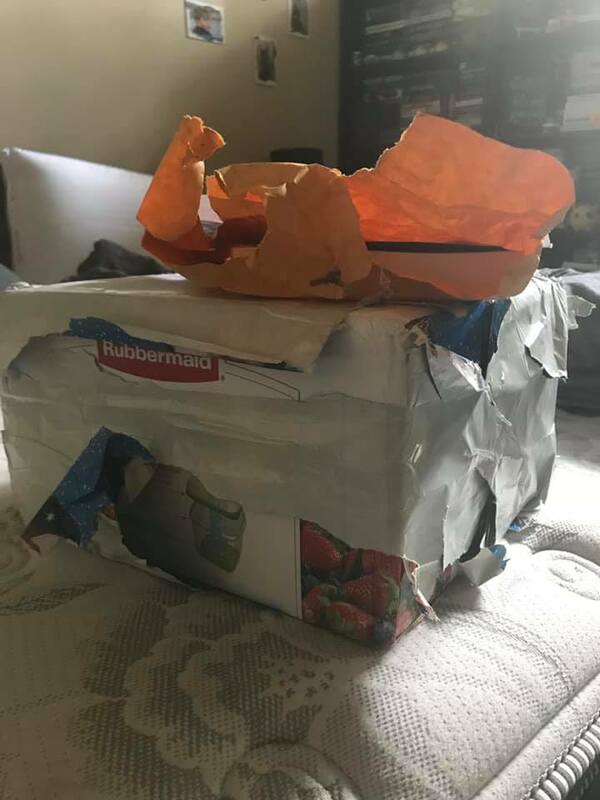 The box was then wrapped up in packing tape a few dozen times to stop the box from disintegrating, and NO admittance by the USPS that they damaged the packaged. I know switching to the private sector for my shipping needs won’t hurt the USPS at all, but I need to feel some sort of justice. I am SO done with the USPS. We do a lot of shipping and pay for priority shipping. VERY inconsistent and unreliable. Sometimes packages are on track and other times takes four or five days. Cannot count on them. My packages will be sent UPS from now on. Do not care how much it costs at least I will know it will get to it's destination when UPS guarantees it will. I pay for Priority Mail and USPS does not get it there in the time that I pay for. USPS is circling the drain...it's just a matter of time! My brother mailed a package to me on May 6,2015 from Evansville, IN to Ballwin, MO, which is approx. a 2 hour drive. The box contained letters written from our father in 1946, which contained very sensitive info. The box has been lost. We have done everything in our power to trace its WHEREABOUTS. My brother was rudely told by the PO in Evansville, he was welcome to check their warehouse to look for it among the other 3 million packages lost. Today is May 11, 2015, it is unbelievable of the unprofessional attitude of our US postal service. Before this I always supported them and would choose them over the competitors. I'm so disgusted, I will share this experience with everyone. Is it poor management or uneducated people? To Scranton Residents that have had complaints regarding a “New PostMaster” Sanovia Williams Arceneaux that most of us…if not all of us have issue, after issue receiving or mailing our mail. I personally have been here 9 years & never had a problem with anyone until Sanovia comes to town. My understanding is that she got here because the Post Master in Manning recommend her because he was trying to get her out of his office. Imagine that! This is a small town…..we have people who have lived here for years & live off of the checks that have been returned. Letters are sent back, causing more postage & late fee to customers, my banking records are getting sent back, my invoices are getting sent back, christmas cards/gifts sent back, baby shower invitation sent back, someones Tux got sent back, Coker OIL Company is getting invoices sent back……who only knows what else she has done. This is surely a crooked person running this post office. Scranton used to be known for a speed trap. Now it’s known for the post office that rips off their customers. I’ve heard of packages being signed accepted at the post office, but she says they are not there even though the tracking number states she signed for it & the time. You actually have to show her where she signed for them on your phone & then she seems to find them. Well where have they been the last 2 days that we have been asking you? I personally had situation that I was on a cruise & had been waiting on a package to come in for a customer of mine. The tracking number showed it had been signed for. I had my mother go to Sanovia every day that week & she said Sanovia said she didn’t have it. When I returned on Monday……Sanovia found the packaged that she had signed for over a week ago. The post office isn’t but so big…..where are these packages being hidden? There is obviously a lack of organization in this office. Customers are not receiving mail they are expecting such as monthly checks, monthly bank statements, gifts they’ve order, etc. I run a UPS station at Monograms By Gail. I ship items for customers all the time. I can always go back into the system & pull a tracking number if the customer loose theirs. Well apparently she doesn’t know how to do this. I was in there one day & witnessed her having to figure up a very small amount of change on a calculator. It’s that anyone with any high school diploma would have had enough math skills to do that without a calculator. My 8 year old could have done that transaction much better. The guy she was dealing with just shook his head at me in disbelief. I did address several of these issued to Sanovia last week expecting an answer or at least an excuse. She couldn’t give me either…..she says I don’t know. I said aren’t you over the post office. She says yes, but I can’t give you an answer. I said who do we file a complaint too. She said well you can file a complain, but it just comes to me (with the attitude complain all you want…..it will not do you any good.) I ask her if she could park in the parking behind the post office. It is very dangerous with people in and out when it’s only suppose to be an entrance. Her response to me was well that is always where Linda Singletary parked (how many years ago)? Linda Singletary retired in 2010 & Linda didn’t park there. I actually spoke to Linda regarding this. Linda & several other current postmasters from other post office have told me all she has to do if pull up the name in the computer & cross reference to know which box something went into, but that would be having to actually work….she obviously doesn’t want to do that. Why is it so many people want a paycheck these days, but don’t want to do anything for it? I just don’t get it. I said….all I am asking is for common courtesy……please treat your customers with common courtesy & that includes trying to learn the mailing system that we are use to whether it is correct or not. No one has ever told us that we were doing anything incorrect. Furthermore…..eventually someone is going to get killed coming in & out of that post office. More likely it will be an 18-wheeler that rolls right thru & flattens the post office. No one wants to see that happen to anyone. Why can’t we work together & get some progress made here? The TV Station out of Florence has contacted me because they have had numerous complaints & bringing it out publicly could hopefully get some more attention on it. I am sending this message to anyone that I have heard of dealings/complaints with her. I wanted to have a report ready for the TV Station. Your name will not be used in the report for the station. We want to hear your story & your experiences in this situation. It can be short or long. If you would like to be in attendance when the TV Station comes down for an interview…..please let me know that too. I have a package coming from India that has been sitting at ISC New York for 4 days and not moving there should be no reason for this it has passed through customs USPS has the package it does not take 4 days to put it on a plane and send it to me. Tracking number rm694068266in. 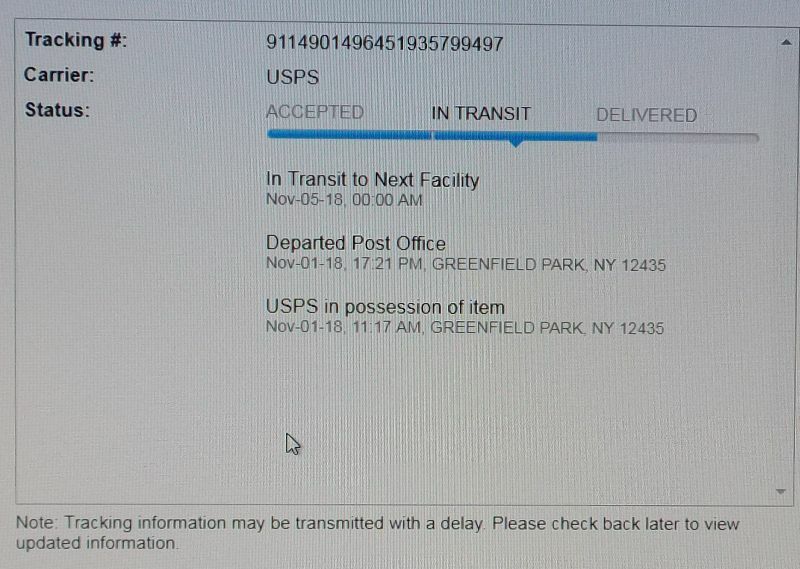 My package coming from thailand prosessed thru thailand on the 18th September 2015 10 days later tracking says arrived post Jamaica New York on September 28 7.20 pm. And know it is March 3rd and it is still sitting in Jamaica New York I called the 800 number for USPS the lady acted like she had no idea but said it should be 24 to 48 more hours to be delivered but had nothing to realy base that info on. Can someone look into tracking number rr063124528th it is registered mail so it had to be scanned and it has been 3 days without moving this does not seem right. I am so up-sad and mad- There’s no excuse for the poor/non-existent service. My packages (the ones being sent and the ones I’m supposed to receive) are disappearing after entering the BELL GARDEN,CA 90201 sorting facility! The only logical reason is that there are thieves working at these sorting facilities stealing our packages. If you search “USPS stealing” on Google or Youtube, you’ll find that it’s been happening to many people. Most of the time it’s the mail sorter or the supervisors who are the culprits. Also, it shouldn’t take long to solve if someone just monitors what’s going on in these facilities. Also the fact that no one contacts us after we report these problems is just stupid and inefficient. How do we know they’re doing their jobs? This whole system is a complete failure. The USPS must have a policy for hiring incompetent people and rewarding them for doing a poor job. We ship hundreds of packages each week and it astounds me how idiotic their handling of problems are when they lose a package. Latest case is a package that was last scanned at the local CA sorting facility and per tracking has not moved since . 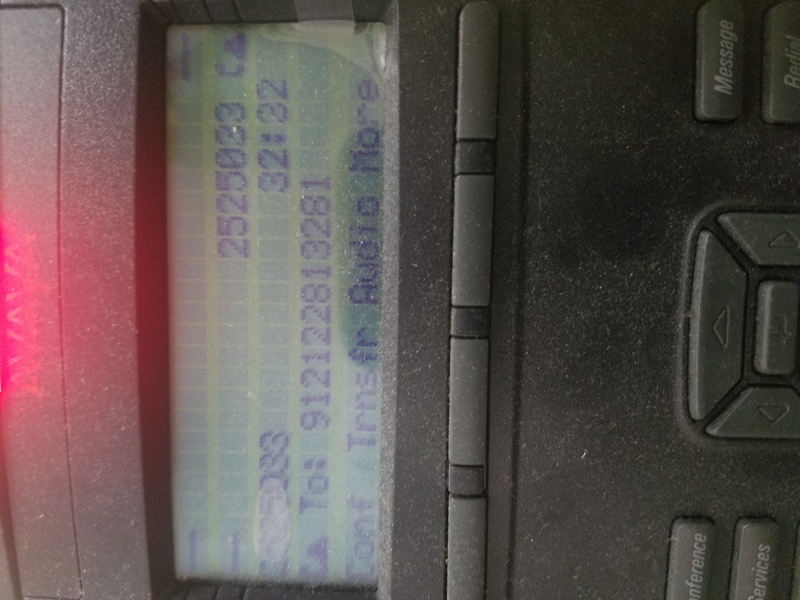 After a number of lengthy phone calls (being on hold for the most part) someone who must surely be the least intelligent person on earth at my local ‘USPS consumer affairs’ office tells me that there’s nothing she can do because the ‘sorting facility works nights and consumer affairs doesn’t so I can’t contact them’!!! The most disturbing part of it all is how OK USPS employees seem to be with their inability to perform simple tasks. When I remind them that besides the lost merchandise I have paid them to perform a service (deliver a package from A to B0 which they clearly have not, their response is ‘well the package wasn’t insured’. What exactly are we insuring against? Your inability to do your job??? Name one other business that operates this way. I have even emailed the Post Master multiple times through their website and have not ONCE gotten a response. A valuable package was mailed to me, priority second day mail, on the Oct. 15 to arrive on the 17th. The package was "miss sent" to another area, White Plains, New York, 10606 according to an agent at the White Plains office, rather than to Hurleyville, NY. The last documented notice was Oct. 17. Today is the 20th and the same message from the 17th appears on the USPS tracking page. The website states that the item is being sent to its destination. It is impossible to speak with a human although the USPS website indicates that representatives are available between the posted hours. This is not an isolated event. I have had several packages rerouted although address labels are clearly written on each package. My biggest frustration is the inability to speak with an agent through the posted website in order to get a concrete answer to my query so that if the package is actually missing I can contact the seller in order to resolve this. Package is now 3 days late, and there is absolutely no useful information about its status either in tracking app or via their phone support. Pathetic. Sent a card for Halloween to my nephew at Bowling Green College with 20 dollars in it and he never received it. Was mailed October 2014 out of Mount Pleasant pa Post office. Have feedback for Postal Service?